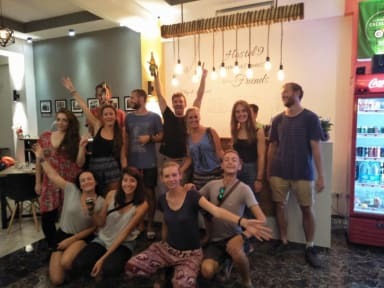 Hostel9 Yangon i Yangon, Myanmar : Boka nu! 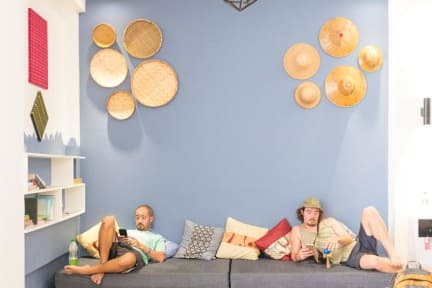 Hostel 9, located in the heart of the bustling China Town area of Downtown Yangon, is the ideal, laid back place for travellers on a budget to rest and enjoy all that Yangon has to offer. The friendly staff are on hand 24/7 to help with your travel plans, to point you in the right direction for a good night out at one of the city’s busy nightspots or tell you about the many fascinating cultural and historic sights to see and visit. Or you may want to take the opportunity to spend some time in Hostel 9’s ‘chill-out’ spaces. Choose from the comfortable ground floor lounge, where you can play games, use the free Wi-Fi, take a refreshing beer, play music or just meet new friends and chat about your travels or try out the cosy roof-top bar (Weather permitting! Remember we do get the Monsoon here!) up above the noise and rush of the streets. If you have an artistic streak, you may want to talk to us about adding to our collection of colourful, painted murals in the stairwell. All left by previous, talented guests as a reminder of their visit and inspired by their travels, as well as their homes, all around the world. Decent accommodation if you're mainly looking for a bed for the night. But the location is quite off (the "happening" part of Chinatown doesn't begin until 19th/20th street, so it's a bit of a walk to get there). The staff were nice and helpful, but unfortunately didn't speak much English. The dorms were OK, but the AC kept dripping and soaked all of our stuff. The breakfast was nice though, as was the wifi. But I wouldn't say it's worth paying 7$ per night to stay there.